Thanksgiving dinner is simply not complete without a cranberry sauce. While I have nothing against the traditional cranberry-sugar combination, I often find missing an extra layer or kick of flavor – so I devised this chutney. Chutneys are concoctions of sweet and savory fruit, spices and herbs, resulting in a well-rounded mouthful that pops in your mouth. This recipe is not heavily weighed down by too many spices, so the humble cranberry shines through – which, of course, is a requisite for Thanksgiving. This chutney is not just for the Thanksgiving table. Use it as a condiment for roasted pork, duck and chicken. It’s also delicious when served as a condiment on a cheese board, or dabbed on crostini with soft goat cheese. Makes about 2 cups. Place the figs in a small bowl. Pour the Port wine over the figs. Set aside for 30 minutes. When the figs are ready, place the cranberries and sugar in a heavy medium saucepan. Heat over medium heat until sugar dissolves. Add the figs and Port wine, the ginger, orange juice and zest, pepper, salt, and rosemary sprig. Bring to a boil, then reduce heat to medium-low. Simmer, uncovered, until the cranberries burst and the chutney has thickened, stirring occasionally, about 20 minutes. Remove from the heat and cool completely. Discard the rosemary sprig. (The chutney may be made up to 2 days in advance. Cover and refrigerate. Serve at room temperature). I love the variation that a savory cranberry chutney provides! Figs and cranberries are divine.together. I made a cranberry chutney last year from the Macrina cookbook that had mustard seeds in it. Yours sounds wonderful and I’m adding it to my Thanksgiving list! 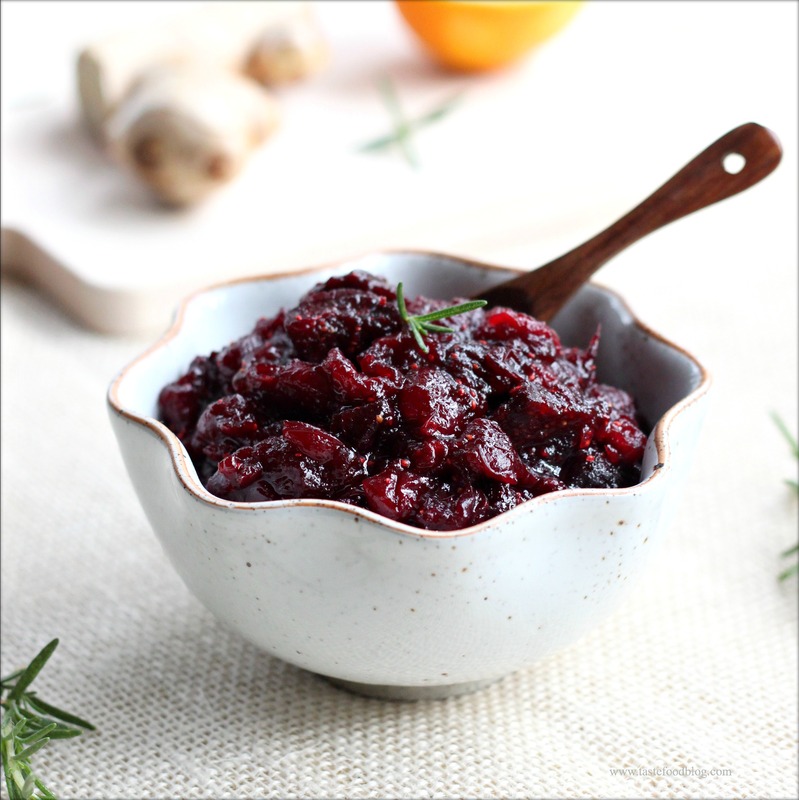 I just guest-posted with my cranberry chutney but will try yours next – love the figs and rosemary! Wonderfully festive, spicy and fruity! Sounds great Lynda, love the port and the spices here. I am new to pairing figs and cranberries and am thinking this is a great way to change up the traditional holiday menu! An splendid recipe! What a great way to twist up my favorite chutney. I always have fig preserves in the fridge as I consider it a staple, so I know I would love this. Oohhh…I was thinking of trying a new cranberry sauce this year, this just might be the one. I love the figs in here with the ginger! I might have to try a new cranberry sauce this year, and this is it for me! I have everything for this recipe, what an ingenious combination! You know how there’s always a sad little container of cranberry sauce in the back of the fridge for a couple of weeks till someone takes pity on it and throws it out? Not this year! I made this recipe and everyone loved it. We served it with latkes the next night, and I couldn’t stop snacking on it spread on homemade bread. This will be the one I make every year from now on. Thank you! I made it using 1/2 teaspoon of cardamom, 1/2 tablespoon of ginger, and 1/2 tablespoon of cinnamon to give it some holiday flair, and by golly it was good and spicy. Great recipe, however, I am afraid to use pepper.